Looking for somewhere to enjoy an amazing day out for the whole family? The Sea Life London Aquarium is both entertaining and educational – and with a Sea Life London Aquarium discount voucher you can treat yourselves to a visit without breaking the bank. Whether you have children to entertain during the school holidays or you're just looking for somewhere a little different to enjoy a day out, Sea Life London Aquarium vouchers guarantee a good time for less. The Sea Life London Aquarium launched as the London Aquarium in March 1997 and is currently the biggest aquarium in London. Welcoming around one million visitors every year, it can lay claim to being one of the capital's top tourist attractions and is located on the city's vibrant South Bank. The attraction boasts a wide range of exhibits, with approximately 500 different species on display and tanks totalling a massive 2 million litres throughout the aquarium. The Sea Life London Aquarium is a great place to visit to learn more about the world's oceans, their fascinating inhabitants and what we can do to protect them from harm. Children and adults alike will enjoy exploring the aquariums wide array of attractions, getting up close to fantastic species such as sharks, stingrays, octopuses, stingrays and more. Some other popular residents include clownfish, lobsters, jellyfish, piranhas, penguins, crocodiles, turtles and seahorses. The aquarium has a particular focus on sharks, with over 40 from 12 different species and the dedicated 'Shark Walk' attraction which allows visitors to walk through an underwater tunnel alongside the fearsome beasts. The aquarium also plays host to a variety of interactive events throughout the day – from public feedings and diving displays to fantastic touch pools – so there's always plenty to see and do. The Sea Life London Aquarium is also committed to conservation and education, with two dedicated classrooms used for educating school children on a range of environmental and marine issues as well as extensive conservation programmes. The aquarium works with the Marine Conservation Society to promote the creation of Marine Conservation Zones around the British coast to preserve the country's incredible marine life, as well as running its own conservation programmes focused on campaigning, rehoming and rescue. They also run a successful breeding programme for endangered animals including Cuban crocodiles, seahorses, jellyfish and butterfly goodeids. Want to plan your own visit to the Sea Life London Aquarium? With Sea Life London Aquarium vouchers you can enjoy a fantastic day out without spending a fortune. Whether you live in London and want something to keep the kids entertained during the school holidays or you're planning a visit from further afield and want to take in one of the capital's top attractions, Sea Life London Aquarium offers are a great way to save money while you enjoy yourself. Browse our website until you find the Sea Life London Aquarium vouchers that are right for you, then navigate to their website to book your visit. Click the 'Buy tickets' button on the right of the page. Select the type of ticket you want to buy. Choose quantity and click 'Continue'. Select a time to arrive at the attraction. Enter your Sea Life London Aquarium voucher codes where applicable. Want to find out more about all the attractions you can see at the Sea Life London Aquarium? Why not check out their dedicated YouTube channel? You'll enjoy lots of exclusive content from the Sea Life family of aquariums including video footage of exciting underwater creatures, features on new and baby residents, documentary featurettes and more. You can also use these channels to find out more about saving money with Sea Life London Aquarium vouchers. Enter your Sea Life London Aquarium discount voucher where applicable. Need to contact the team at Sea Life London Aquarium? Whether you have a question about your booking, want to know more about facilities and feeding times or simply want to find out more about saving money with a Sea Life London Aquarium discount voucher, you can contact the Customer Services department by telephoning 0871 663 1678. Want to find out what's happening behind the scenes at the Sea Life London Aquarium? The company maintains a profile across all your favourite social media networks. Follow them for sneak peeks at some of the aquarium's newest residents, competitions, documentaries and more. You can also use these pages to find out more about saving money with Sea Life London Aquarium vouchers. Don’t forget to check them regularly, as you can never be sure when free Sea Life London Aquarium voucher codes might be waiting for you! Buy now online at www.visitsealife.com/london. My kids love going to visit aquariums, but the cost of tickets can add up. Luckily, I found a Sea Life London Aquarium discount voucher online. Sea Life Aquarium London offers so much for kids of all ages, from sharks and stingrays to exhibits that teach them the importance of marine conservation. 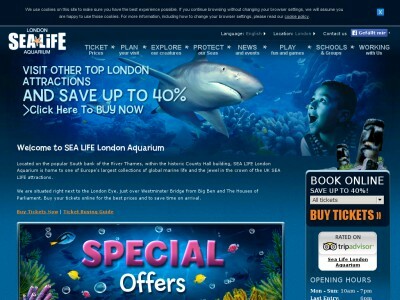 Thanks to Sea Life London Aquarium vouchers, I can buy tickets in advance from visitsealife.com and take them to their favourite attraction whenever we're in the capital – so now I recommend Sea Life London Aquarium voucher codes to all my friends with marine-mad kids!